I recently subjected myself to a new type of torture, or what many people call exercise. Bootcamp to be more exact. Now I’m no stranger to working out, and usually before work, but I was committed to this bootcamp for two weeks – 6 AM workouts M-F, and 8 AM workouts on Saturday. Oh, and don’t forget about the strongly encouraged second workouts on all these days. While I make it out to be hell, it was actually a lot of fun. I was searching for a new type of workout, as my typical routine had put me into plateau mode. What’s more, not only are there four wonderful bootcamp coaches pushing and supporting you throughout the two weeks, but the camaraderie in the 31 person group was extremely foreign and amazingly inspiring to me. On the last day, we decided to do a potluck, and I offered to bring Jell-O shots. No one seemed extremely against the idea, so I went for it! The last time I made fancy Jell-O shots (watermelon mint), they turned out pretty good, although I had some trouble with the gelatin sticking to the watermelon rind. I was a bit scared I’d have that same issue this time, but I didn’t at all. They turned out so well and everyone seemed quite impressed. It’s hard to pick a clear favorite here with the delicious flavors; the lemon meringue was dreamy, the Arnie Palmer was summery and refreshing, and the greyhound was perfectly tart. They are super simple, and get a lot of great compliments, so try them out at your next gathering! 1. 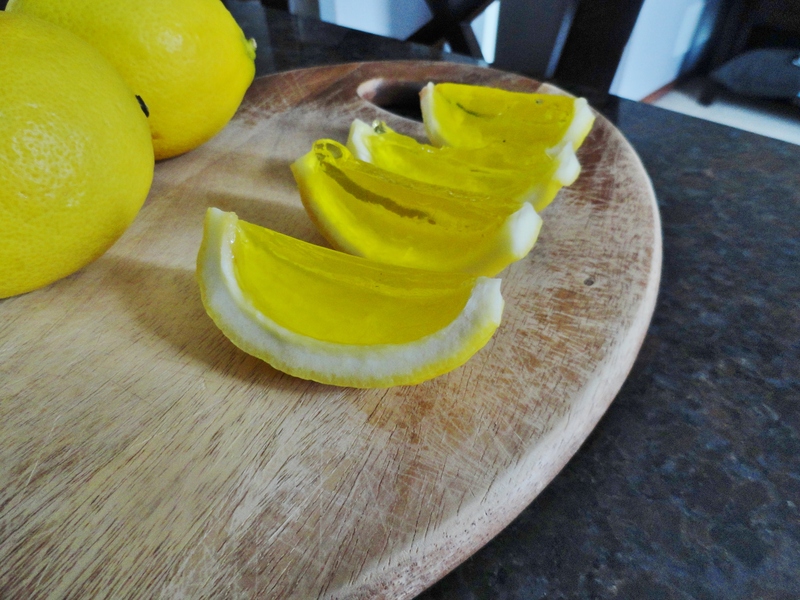 Cut each lemon in half, lengthwise (so pretty much the opposite of how you would if you were regularly juicing a lemon), and juice them carefully without tearing the peel. Save juice for another use (freezing in ice cube trays works great!). 2. Hollow out each half, again being cautious not to puncture the peel. I used a grapefruit knife to loosen the edges and was able to pull the inside segments out easily. Place halves in muffin pan to help keep them balanced while setting. 3. Make Jell-O according to package directions, except in place of the cold water, substitute your vodka. 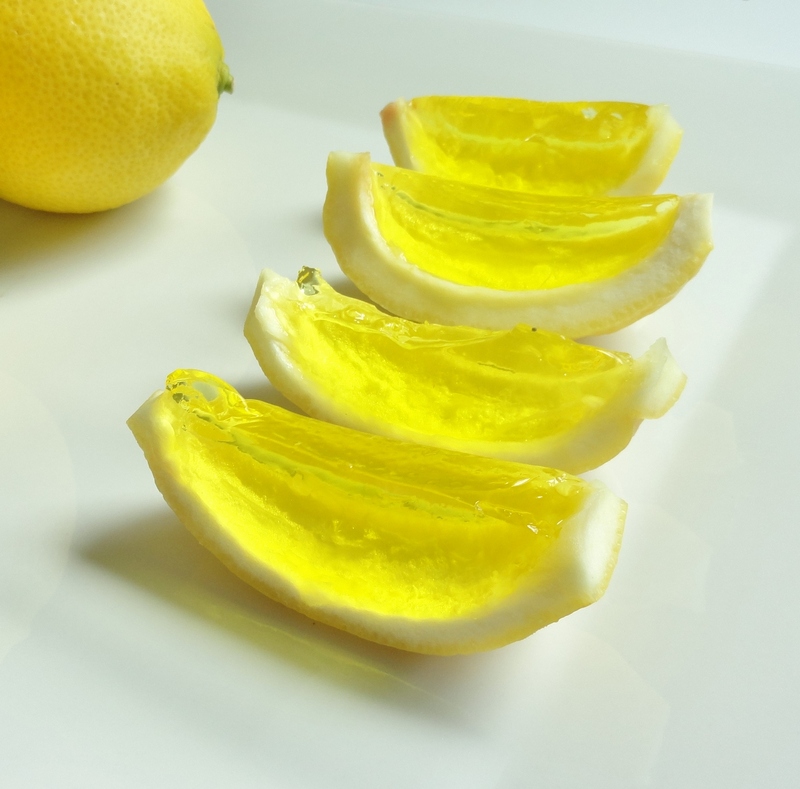 Fill each lemon half and refrigerate until set. It’s easiest to pour mixture into a liquid measuring cup for easy pour into the peels. 4. Once set, use a sharp knife to slice into wedges and serve. Depending on size of lemon, you can get at least 2 wedges out of each half, sometimes more. 1. 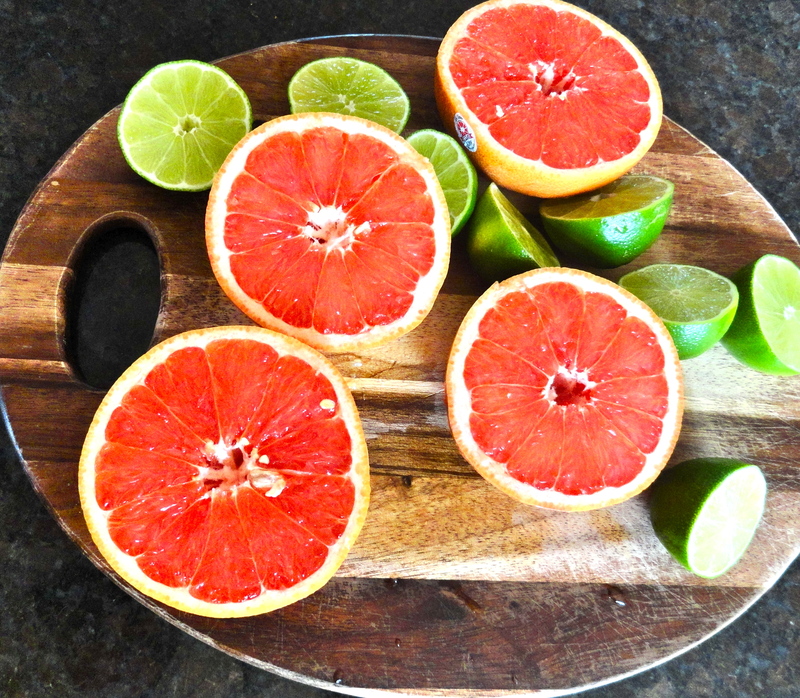 Cut each grapefruit in half, and juice them carefully without tearing the peel. Strain the juice to remove any pulp or seeds. 3. 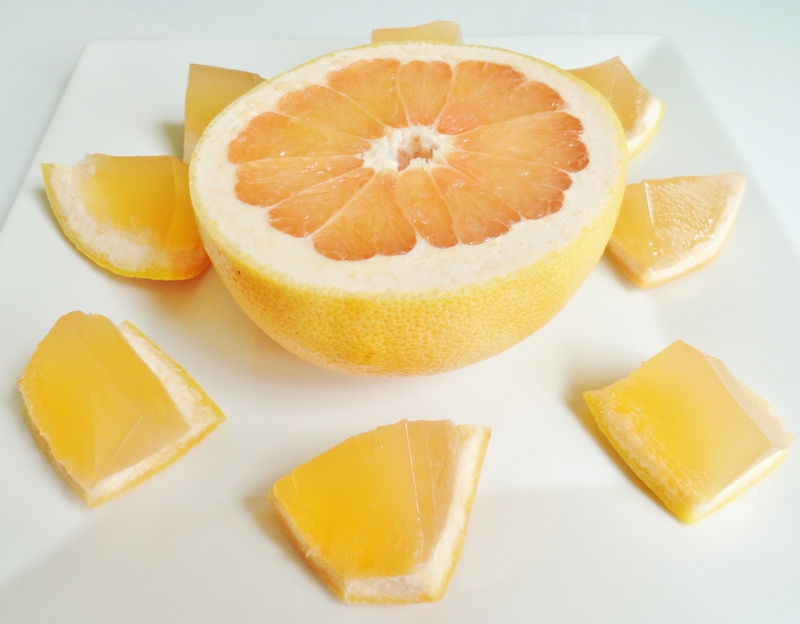 Pour 1 cup of the grapefruit juice into a small saucepan and sprinkle with Knox gelatin. Add 1 tbsp. 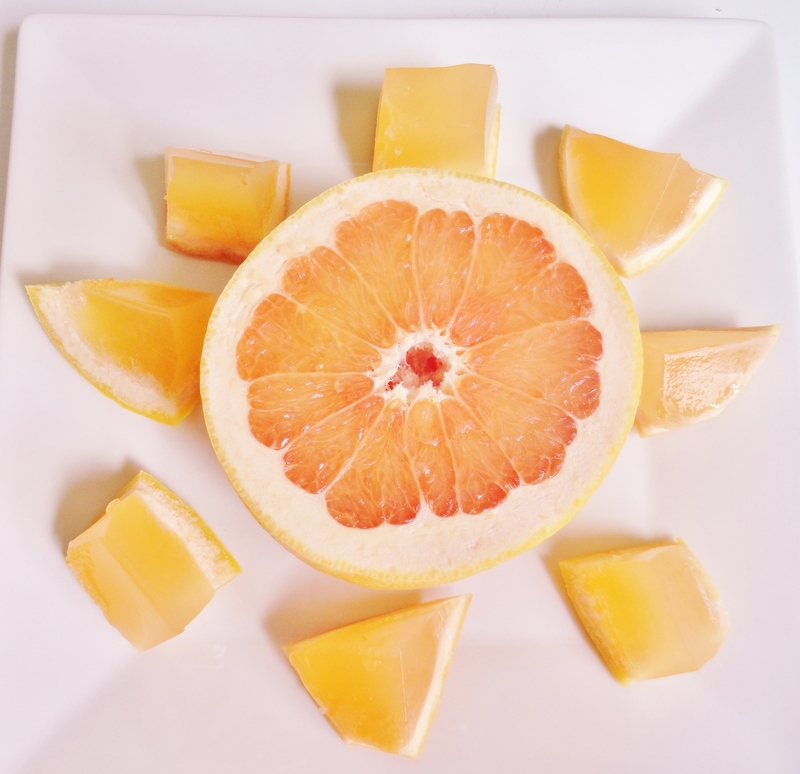 of sugar (use up to 1/4 cup if you like really sweet grapefruit juice – I prefer unsweetened) and heat until gelatin and sugar have dissolved, about five minutes. 4. Pour in vodka and water and transfer to something with an easy pour spout, like a liquid measuring cup. 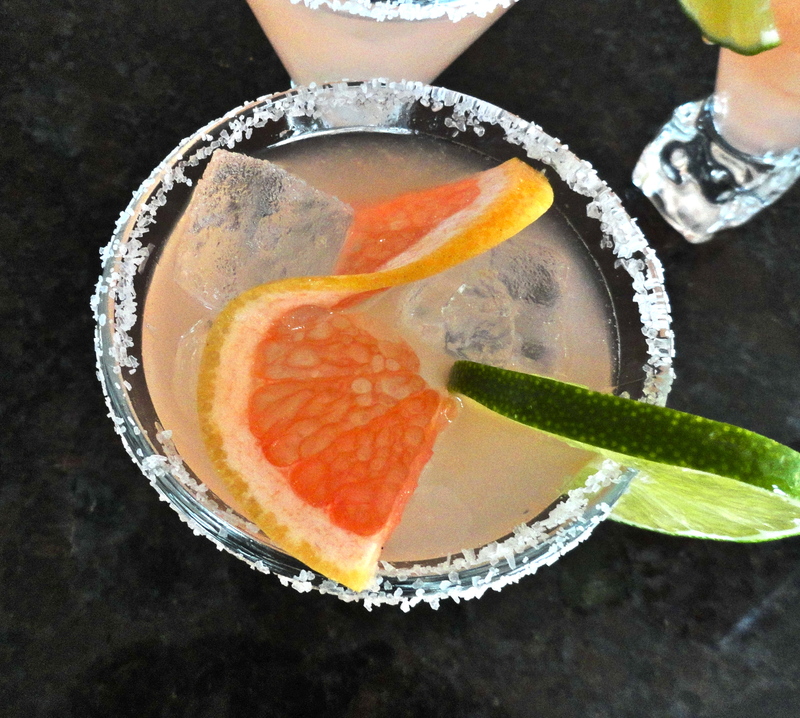 Pour in grapefruit halves and refrigerate to set. 5. Once completely firm, cut each half, in half, and then in half again. Depending on size, you may want to cut them even smaller. Need something to warm you up during this artic blast? We had a long awaited drink tasting party at our house in December, with a Secret Santa theme. We’d already had a holiday drink theme a few years ago, so we wanted to keep it holiday-ish, but also not do the same theme we’ve had in the past. What we did was draw names out of a hat to decide who had who as a Secret Santa. Each couple or person was assigned a secret ingredient from their Secret Santa, which was required to be in their drink. We definitely had some interesting ingredients – wasabi, lychee fruit, Chinese five spice (what we assigned :P), and then we had some main stream ingredients, such as ginger and oranges, which is what we were assigned. Though we had a pretty common ingredient, we still wanted to make something somewhat creative, so we made a spiced cider with brandy. I wasn’t really sure that I liked brandy before this experiment, but it goes perfectly with this cider recipe. Nate and I have made it on Sunday to drink with the early football game! It’s mostly a combination of spices you’ll already have in your collection, plus cider, oranges and brandy. Pretty simple, right? Oh, and it tastes so good, especially if you are nursing a cold! Orange You Glad this Cider has Brandy In It? 1. In a deep saucepan, mix all ingredients except brandy. Bring to a boil, then reduce heat to low. Simmer for 30 minutes. 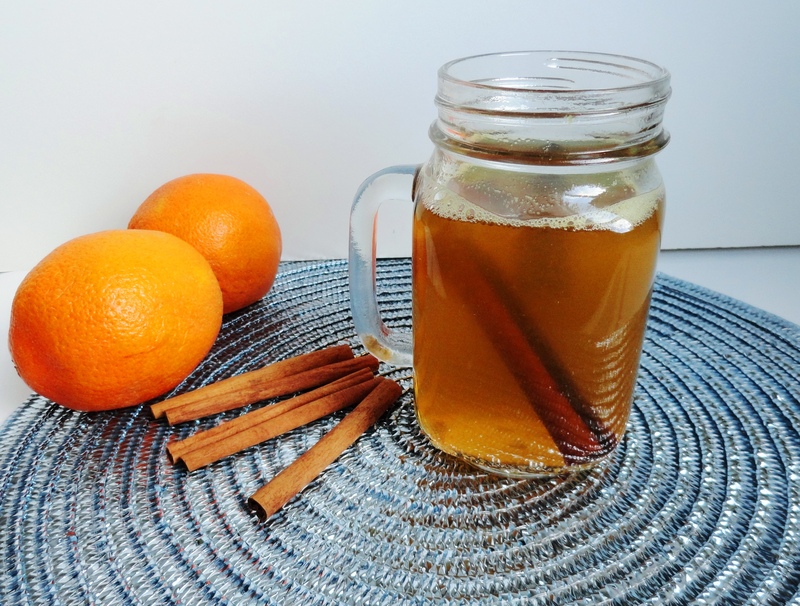 Strain cider into mugs and serve with a dash of brandy, if desired. Like my mango pineapple popsicles, these are insanely refreshing on a hot summer day. The best part is that you know exactly what went in them, and it was pure deliciousness. I used frozen peach slices for this recipe, but you could use fresh. I thought for the price, it was totally worth pealed a pitted peaches. 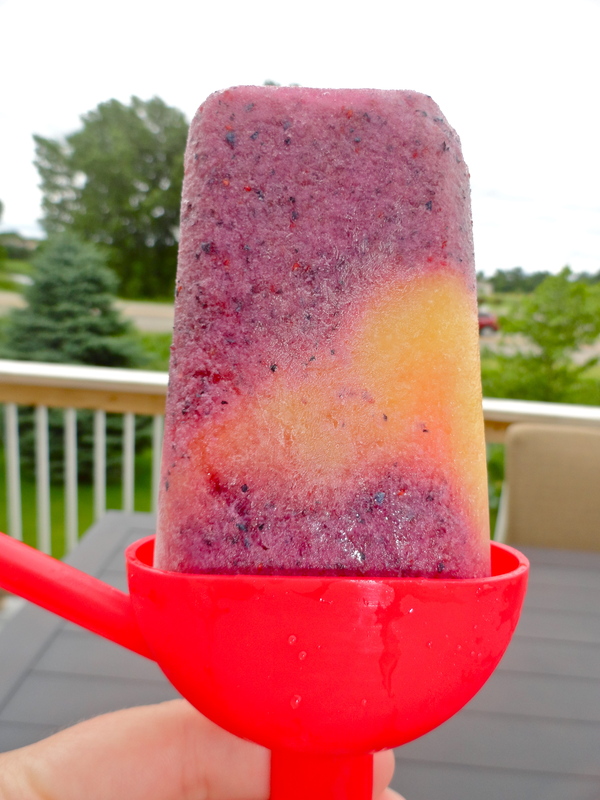 I used fresh blueberries, but frozen would work just fine as well. Add a little of your favorite booze (I used vodka) and make it a party snack. These will be sure to go like hot (cold?) potatoes! 1. In a blender, combine peaches, 1/2 cup fruit juice, 1/4 cup yogurt, 1 tsp lemon juice, 1/2 tsp vanilla and 1/4 cup vodka. Blend until smooth. Transfer to bowl and rinse blender. 2. In the blender, combine blueberries and remaining fruit juice, yogurt, lemon juice, vanilla and vodka. Blend until smooth. 3. 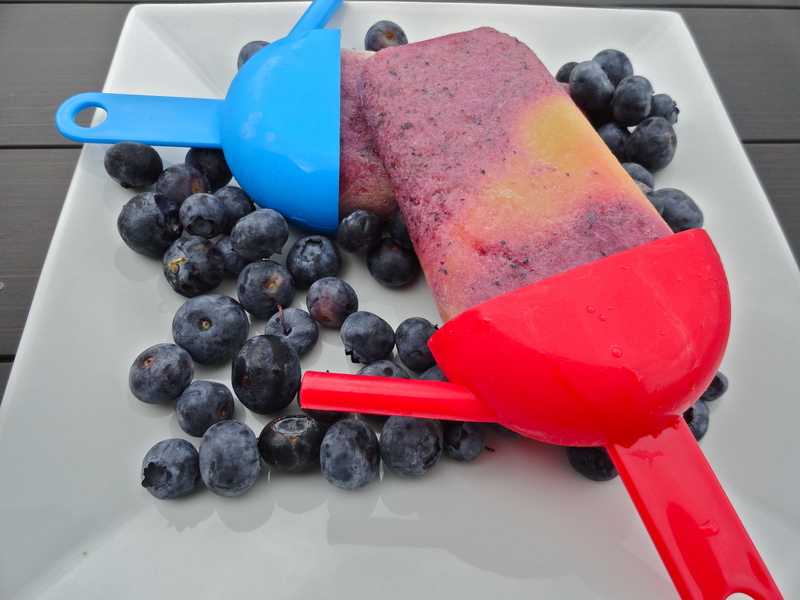 Layer peach and blueberry mixture into popsicle molds and freeze until solid, at least 8 hours. It is truly finally summertime, which means it’s hot out there. We had a beautiful weekend, and spent all of Sunday outside staining the railings of our new deck. It’ll take a few weekends of staining, but it’s almost completely done. The problem has been waiting until we had a dry span of days to do it, as we’ve had a slew of not just rain, but severe storms. But alas, I think we’ve earned the right to get some gorgeous days and warm weather. 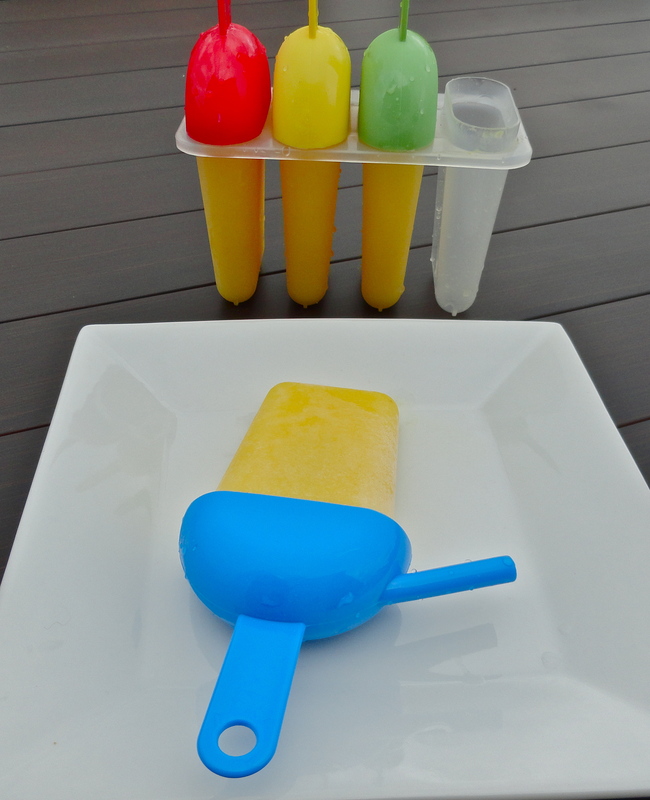 I made these popsicles last week and was really looking forward to eating them on a hot day. We definitely worked hard, so they were a nice and refreshing treat to take a break with. 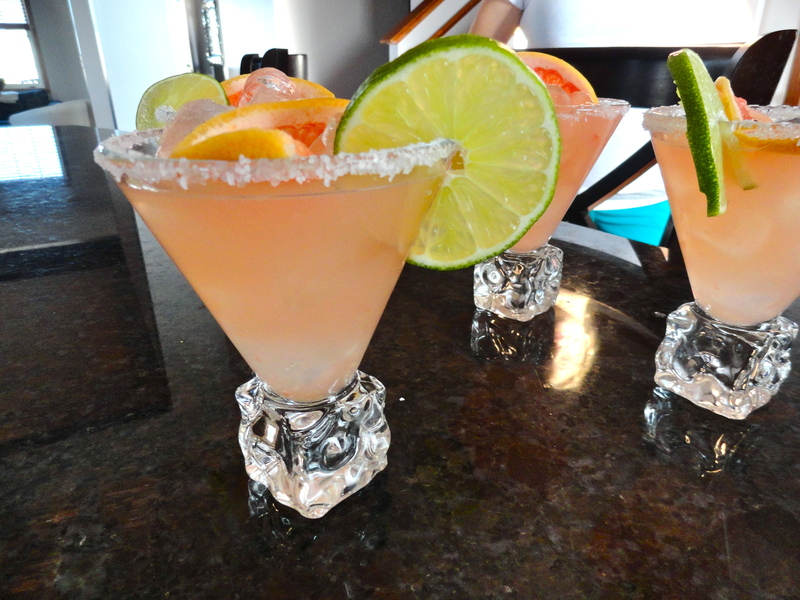 Better yet, they are slightly boozy! I hesitated to put too much vodka in them because I wanted to be sure they froze, but next time, I think I’ll be adding just a skosh more. The great thing about these popsicles is that you know exactly what went into them, and it’s not some weird cousin of sugar that you can’t quite pronounce. I went to the store the very morning I saw this recipe posted on Thug Kitchen. I actually got ingredients to make both the mango pineapple popsicles and the blueberry peach popsicles. After already adding the vodka, I thought that coconut rum would have been a better addition in these. Oh well, next time. But wait, I sort of had that opportunity! 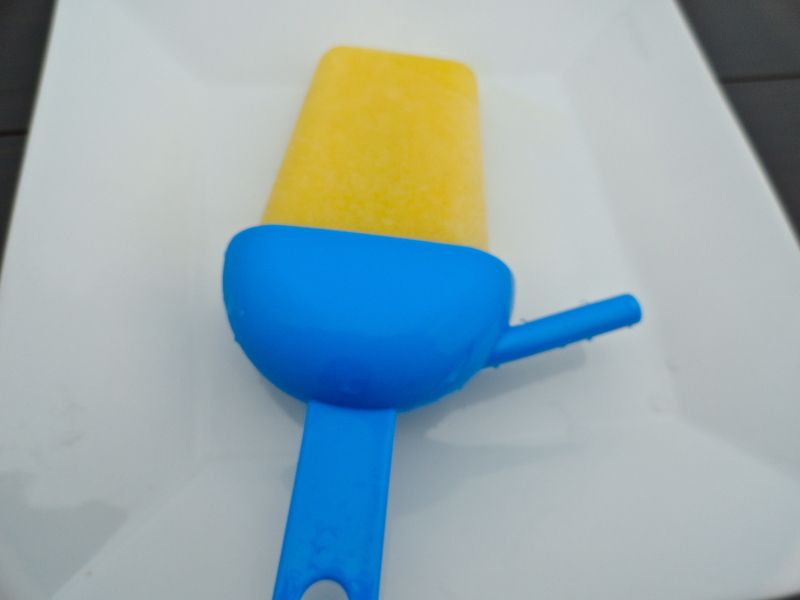 I didn’t have enough popsicle molds to use up all the mix and I had about 1 cup left. 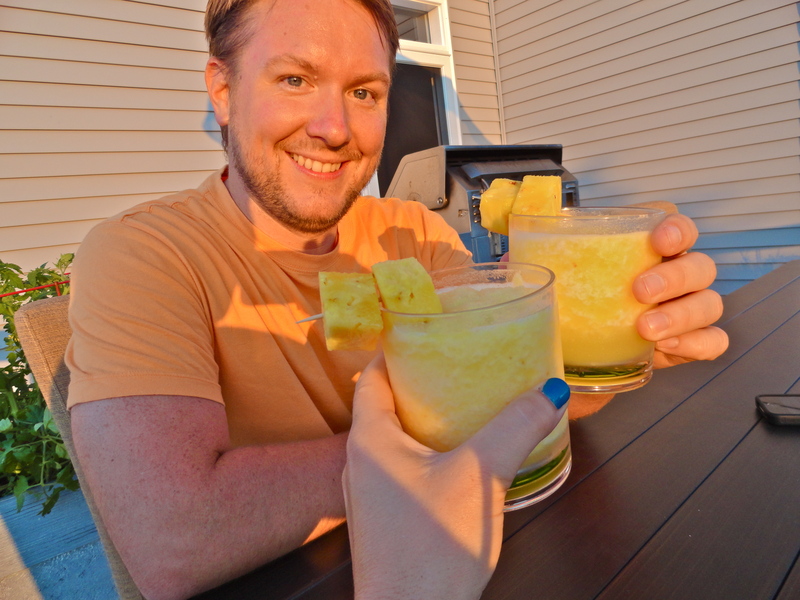 Nate was planning to make us daiquiris for dessert on Sunday, so instead of using a mix, we just used the leftover popsicle mix, added a few more pineapple slices, Malibu rum, and ice. 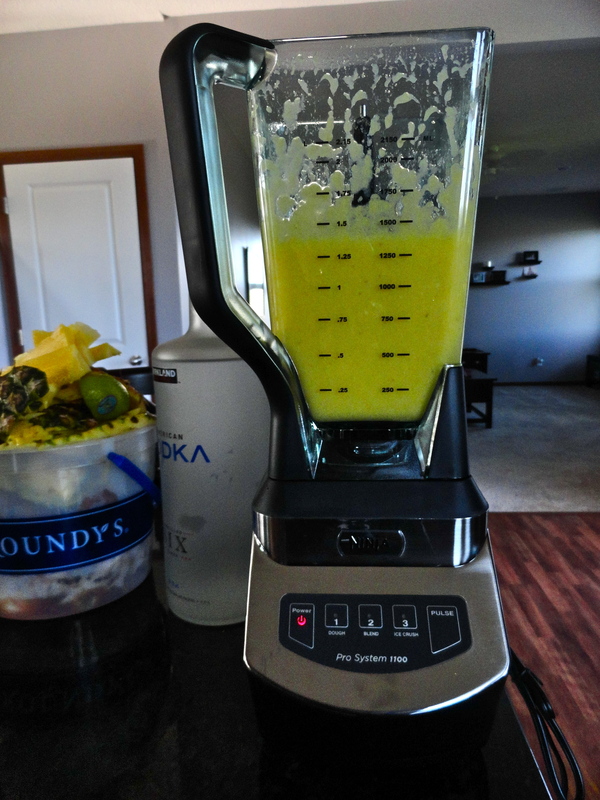 Hit blend on the Ninja for a few seconds, and you have yourself a lovely pineapple daiquiri. There’s no end to our creativity! The popsicles would be a super fun treat to serve your friends after they’ve helped you do some horrid job that only your good friends (or family) would volunteer to help with. I suppose they’d be good for a summer party, too, but make sure your guests work for them. They’re worth it! 1. Put all ingredients into the blender and blend until smooth. Taste and adjust any ingredients as desired. 2. Pour mixture into your molds and let freeze until solid, at least 8 hours. As stated on Thug Kitchen, don’t give up if you don’t have popsicle molds. You can use paper cups and popsicle sticks, or even fill up your ice-cube tray and use toothpicks. You might need to freeze for an hour or so before putting in the popsicle sticks or toothpicks so they stand up straight. If you have leftover mix, feel free to blend yourself up a daiquiri! I can take zero credit for this amazing drink, but I absolutely had to share it with you. One of the blogs I follow, Sore Legs and Scrambled Eggs, just posted this amazing after dinner drink (if you haven’t checked out her blog, you should, it about food and fitness!). It is really simple, but the coffee ice cubes are the best part! Many people like to have coffee after dinner, and I’m no exception. However, sometimes you want to spice it up just a little. 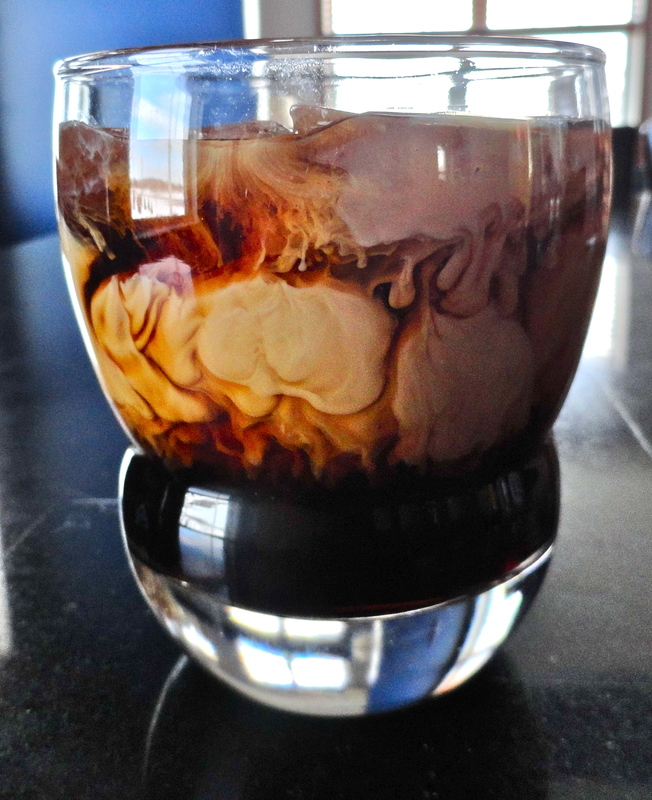 Not only is this a great way to get a little caffeine fix, but also a brilliant idea to use up any leftover coffee in that huge pot you made this morning. 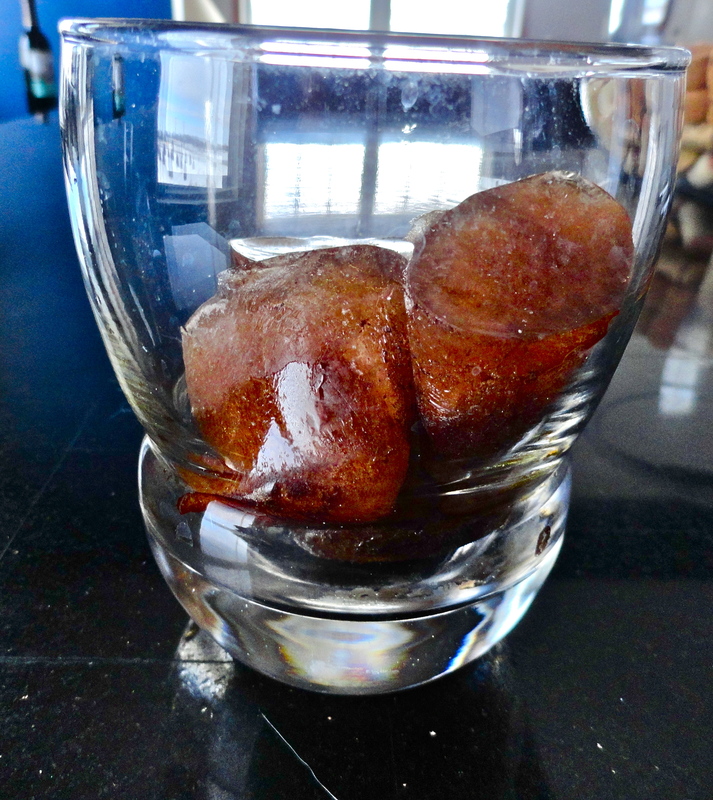 Coffee ice cubes! They’re also great for making an iced coffee without the bummer of getting watered down by regular ol’ ice cubes. The beauty of this drink, as Ashley eludes to, is that it continually gets better. 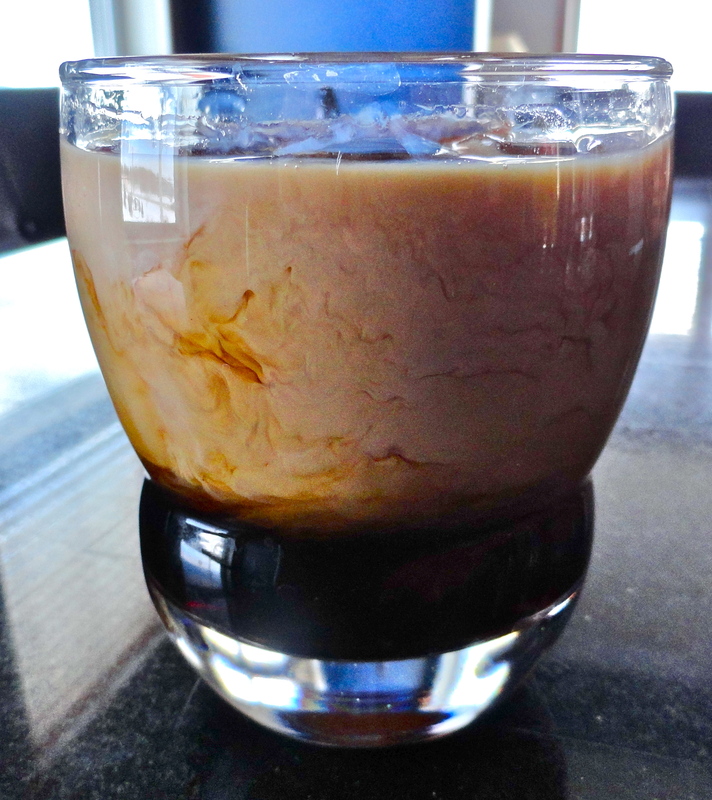 The flavors start out with just the liqueurs and vodka, but as the ice melts, you get a rich wonderful coffee flavor. I substituted vanilla vodka for her cake vodka suggestion, but it’s only a matter of personal preference. 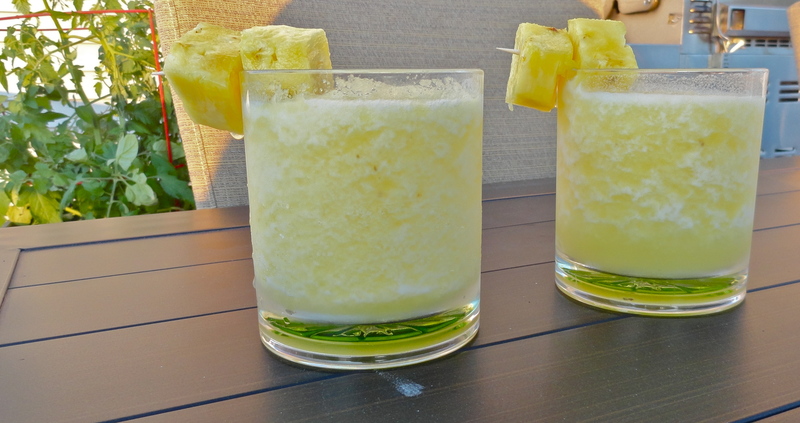 Whichever way you go, you should be sure to try one version or another of this fantastic after dinner drink. 1. Place cubes in low ball. Add vodka, Kahlua and Bailey’s. Stir, or don’t 🙂 I prefer not to so the flavor continues to change throughout the drink.